Let me begin my review of David Vann's new novel by saying that his book started out with a lot of potential. 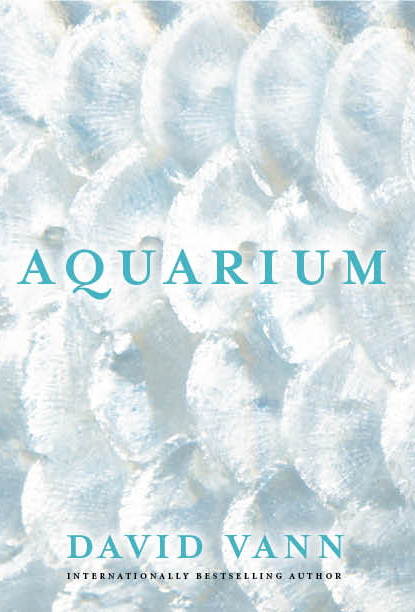 Aquarium is about twelve-year-old Caitlin who lives with her mother in subsidized housing located in Seattle. Caitlin's mother Sheila works long hours as a docker at the container port making minimum wage just to keep food on the table. Every day after school, Caitlin visits the local aquarium to observe the fish. One day, Caitlin meets a stranger while studying and looking at the underwater creatures; little does she know that this stranger will change her life forever. I enjoyed Aquarium. I really did, at least until the last hundred pages. I adored the eye-opening questions that Vann poses about humanity and life as a whole. His meaningful questions about forgiveness, compassion and parenting made me wonder and reflect about my own family life. I was especially touched when reading about certain selfless acts by parents whom dedicate their entire lives solely to their kids; why do parents do this if it is not for their own benefit? Why do my parents do this? What does it mean to love someone to the point of sacrificing everything for that person? The photos of fish were also a beautiful addition to the story and allowed me to transform my reading mind into the mind of a twelve-year-old girl, admiring the caged fish in an aquarium. Caitlin actually reminded me of my own little brother, who also wants to be a scientist when he grows up. However, what I extremely disliked about this novel was the fact that the characters cease developing and grow tiresome to read about; I had to force myself to finish the last hundred pages because of their constant immaturity. What Vann portrayed as real adult-life problems became unrealistic and repetitive annoyances. I started to wonder if Sheila is actually the one who is twelve--or if Caitlin really is twelve--since the daughter oftentimes thinks and acts like she's twenty years older (um, what was with that one *ahem* experimental scene? Not going to reveal anymore...) At first I empathized with the Sheila, whom Vann paints as the very disturbed, antagonistic juxtaposition to Caitlin's innocence. Towards the end, I grew more and more irritated with the way Sheila acted; her childish behavior is understandable considering everything she went through as a child, but Vann took it a bit over the top, adding to the book's unrealistic plot. Additionally, the climactic build-up of something happening at the end kept me impatient and restless, but unfortunately, nothing happens. Throughout the last hundred pages, I surely thought someone was going to do something of value or fix something, but the book just ends without any proper development or closure. All in all, Aquarium had something going for it until around page two-hundred and left me dissatisfied and unfulfilled. Vann's comparisons of human beings to fish were wonderful concepts though. I just wish he left us a little more at the end of the novel.